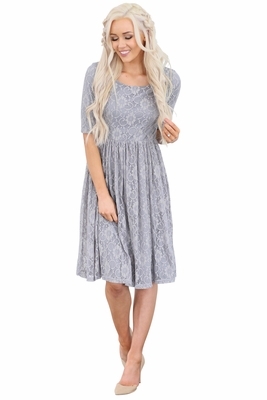 This popular lace dress in Slate Gray features an a-line silhouette with a fitted bodice, round neckline, half sleeves and a flowing, pleated skirt. The lace overlay is a perfect match to the background color. It's ideal for any special occasion or event, but it's also styled simply enough to work well for date night or going to church. It would also make a wonderful modest bridesmaid dress! 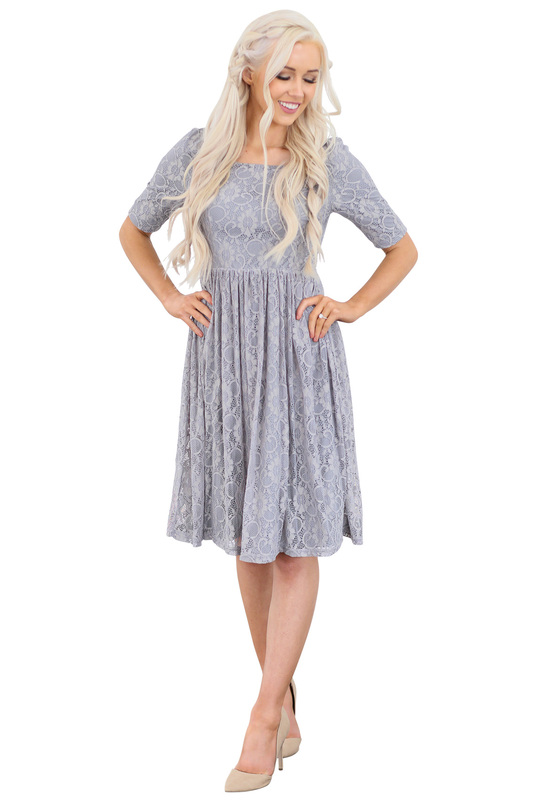 For bridesmaids, make sure to check out the June Dress in Grey! They're the same color & same lace, so perfect to mix & match in your bridal party! Also available in Burgundy, Sweetheart Pink, Blush Pink, Navy, Seafoam, Cream and Peach. Total Length (from highest point of the shoulder to the bottom hem): XS-S 40.5", M-L 41", XL 41.5" *This is the length of the dress including the lace. Please note that the lining is a couple of inches shorter than the lace.